Are You Ready For Vanhalla? Bloomberg picks up on a trend we're all about lately: Vans. We love vans. America loves vans. European vans, in most ways, are better. We are now getting European vans. Bloomberg, of course, ties this to the restarting economy, construction growth, a need for more fuel economy, blah blah blah blah blah. They're right, but we're excited for different reasons. 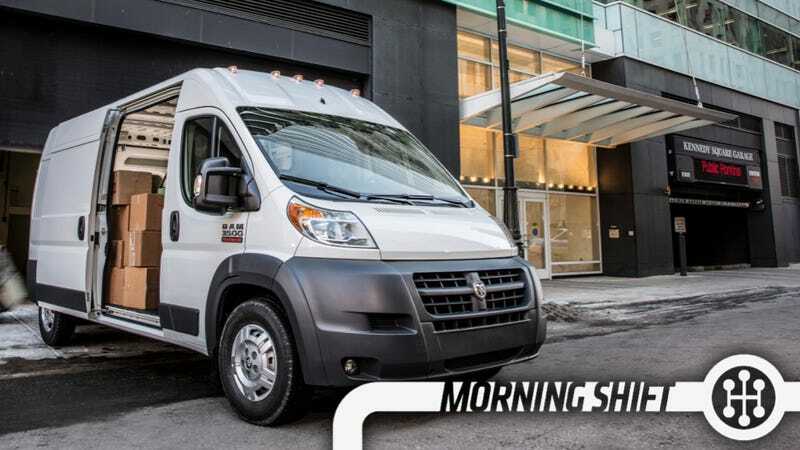 We'll have the NV200 and Transit Connect as small vans here in the U.S., as well as the Ram ProMaster, Mercedes Sprinter, and Ford Transit as big o'l stonkin vans. We think this is the start of a new van culture in America. At the very least, we know Krieger will be excited. So some Jeeps are at risk at catching on fire and Chrysler said "Thanks, but not thanks" to the recall that the government proposed. Instead, they're juking us and recalling 630,000 Jeeps, Compasses, and Wranglers. The Patriot and Compass are being recalled to fix air bag and seat-belt issues and the 221,000 or so Wranglers for 2012 and 2013 are dealing with transmission fluid leaks. Maybe they'll confuse people into thinking they're recalling those other Jeeps. A majority of U.S. House members, taking a break from trying to repeal affordable healthcare for the 13 millionth time, sent a strongly worded letter to President Obama asking him to address the currency manipulation going on in the Trans-Pacific Partnership… which is code for "Those durn yen-weakining Japanese." As David Shepardson points out, the letter never says "Japan" but, c'mon, they're talking mostly about Japan. We've talked about Shinzo Abe, the yen, and Japanese exports before and how the Japanese have one of the most closed car markets in the world. Japan, for their part, is making very slow moves to open up their markets but you can trust they'll continue to argue for the best conditions for them. South Korea is a very tough labor market with the country's working class, coming off an economic boom, hoping to turn some of those big wins on the corporate front into won for themselves. Per Reuters, GM is probably going to pull some of its production from the country starting with the Aveo (which they still make for some markets) and continuing with the Cruze. They may move that production over to Opel in Europe where, frankly, they need the work. Although remote start is just used as a gag for most many of us, those in colder climates save themselves a lot of unnecessary freezing with the option. Therefore, many car owners may be excited to learn that GM is going to offer OnStar RemoteLinkMobile app service free for the first five years. This means owners will be able to start, lock, or unlock the car from wherever they can get a cell service. It's also a way to get consumers hooked on OnStar. GM is like a drug dealer that way. The Wall Street Journal breaks down what everyone else is doing. On this day in 1962, the banking institution Credit Suisse—then known as Schweizerische Kreditanstalt (SKA)—opens the first drive-through bank in Switzerland at St. Peter-Strasse 17, near Paradeplatz (Parade Square) in downtown Zurich. Like many developments in automotive culture—including drive-through restaurants and drive-in movies—drive-through banking has its origins in the United States. Some sources say that Hillcrest State Bank opened the first drive-through bank in Dallas, Texas, in 1938; others claim the honor belongs to the Exchange National Bank of Chicago in 1946. Regardless of when exactly it began, the trend didn't reach its height until the car-crazy era of the late 1950s and early 1960s. Neutral: Which Van Is Your Van? Which of the crops of new vans would you want? Big or small? High roof or regular? Cargo or passenger?